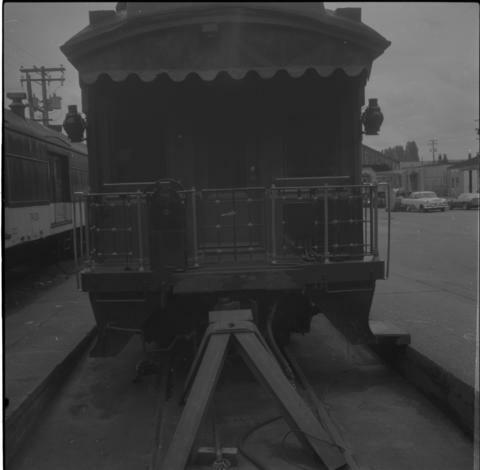 Photograph taken at the VIA Rail depot in Vancouver. Image captures the view end of the Grand Trunk Pacific Railway car, now called the CNR 'Nechako' #15105. Davies notes that it was normally spotted at the location as a semi-fixed installation. Personal or academic use of materials is welcomed under the standard fair use and educational use clauses of Canadian Copyright Law. Commercial use is, however, forbidden without the express permission of the copyright holder. For information on obtaining written permission from the copyright holder, please contact the Northern BC Archives and Special Collections.